Borough Under 11 girls pictured before their game against Wisbech. Yesterday (March 24) was another good day for Borough’s junior section. The Under 16s won their away game at Deeping after it was downgraded from a league match to a friendly when Deeping had to concede the match and borrow some players. Borough came out 26-19 on top with tries from Nathan Fuller, Brandon Tacticos, Owain Masters and Ryan Aliker-Bates. Oliver Hilliam-Cooke successfully kicked three conversions. There was victory too for the Under 15s as they put the previous week’s East Midlands Cup disappointment behind them to beat Wisbech 46-22. 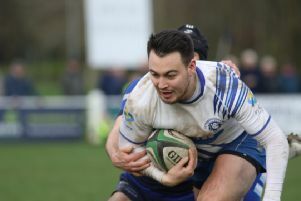 Louis Edwards and William Manning led the scoring with a hat-trick of tries each and there wasa one apiece for Josh Webster and Ethan Manning. Lawrence Teague kicked the rest of the points. Ten of the club’s Under 15 girls squad and two from the Under 18 girls team were on East Midlands duty, completing their inter-region programme with a clean sweep of victories. The Under 13 Girls celebrated a convincing 75-5 victory away at Newark. Alys Masters and Livvy Buchanan scored four tries apiece, Nyahleh Soyei and Poppy Murray two each, with single scores from Abi Tuson, Abbie Sullivan and Molly Rain. The club also fielded an Under 11 girls team for the first time this season as they prepared their players for next season’s move up to the Under 13s. 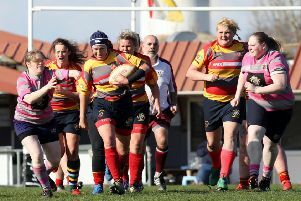 Rose Smith scored the first of four tries in a defeat against a Wisbech boys’ team with a hat trick for speedy winger Jemima Mitchell.